Become enchanted with the handcrafted details of this stunning fairy tale gown called Topaz. Delicate hand cut leaves scatter the front and back of the bodice and enhance the romance of this ivory gown. Very fine spaghetti straps frame the flattering deep V neckline while the underlying cups and lightweight boning give structure and support. The back of the gown mirrors the front, dropping to the waist and into an intricate row of dainty lace covered buttons. The upper lace of the skirt falls higher on either side of the nipped-in waist to create a romantic tiered shape. 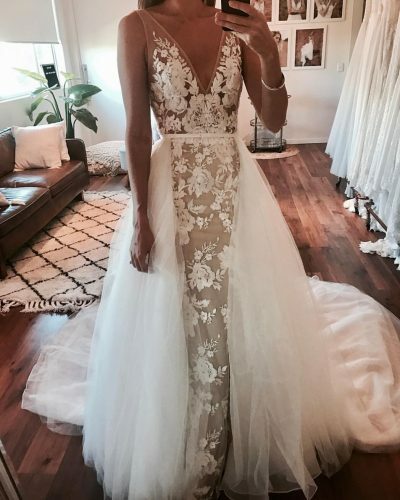 Soft layers of flecked lace and floral motif can be seen peeking gently through, while multiple flutters of tulle and a small train create the perfect fairy tale silhouette.